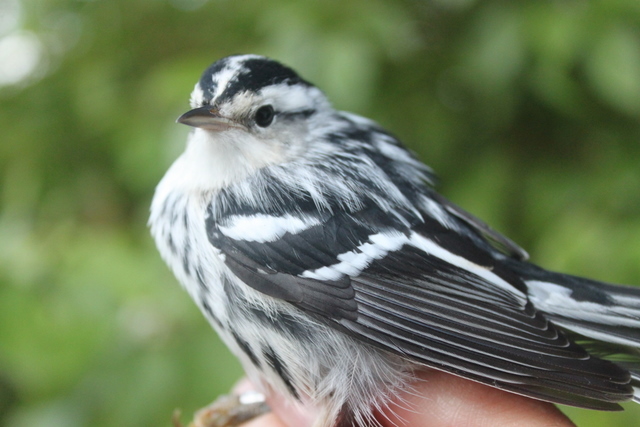 First Black-and-white and Blackpoll Warblers of the Fall! brookser	Fall Banding	Comments Off on First Black-and-white and Blackpoll Warblers of the Fall! 31new, 5 retraps, 16 species. 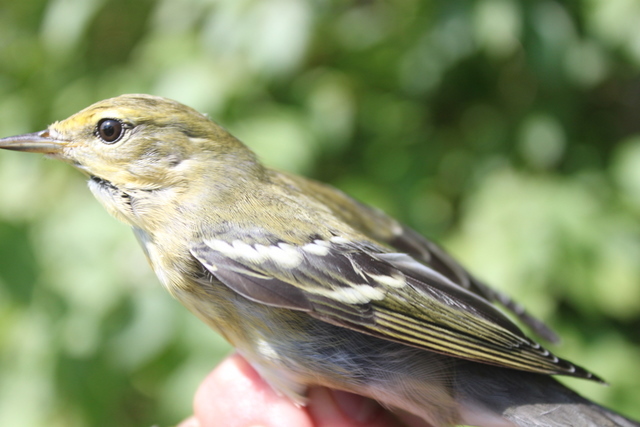 New species Black and white Warbler and Blackpoll Warbler. Another day with southwest winds which would be perfect for spring but not good for fall. Birds of the day were Magnolia Warbler and Gray Catbird with 5 of each banded. The day started warm but as the day wore on it started to get muggy. So we closed early due to lack of birds and the heat. The Slow, Steady Trickle of Warblers . . .
Andrea Patterson	Fall Banding	Comments Off on The Slow, Steady Trickle of Warblers . . .
Thursday, August 29. 39 new bands of 16 species, 12 recaps. New species: Mourning Warbler, Wilson’s Warbler. Birds of the day were Cedar Waxwing and Magnolia Warbler, each with 8 new bands. More than half our species were warblers today (9 of 16), but for the most part we only captured one or two of each species. Nevertheless, it seems that every day brings a new species or two. We are still getting “baby” birds as well – today we saw a small handful of hatch year Cedar Waxwings in their streaky plumage. All had orange (instead of yellow) tips to their tails, suggesting that they have been feeding on Morrow’s Honeysuckle. It was interesting, however, to see the variety of orange coloration from quite pale to intensely vivid. 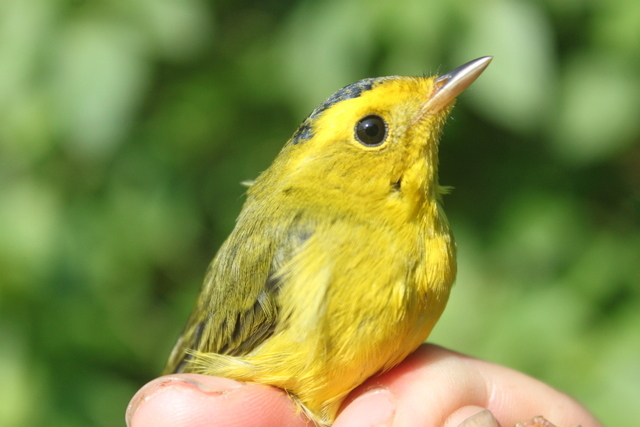 The second Wilson’s Warbler of the season – a young male. Photo by Ryan Kayhart. First Cape May and Golden-winged Warblers! 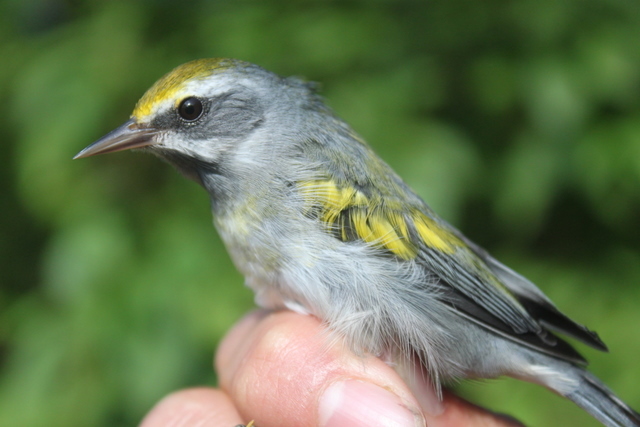 brookser	Fall Banding	Comments Off on First Cape May and Golden-winged Warblers! Wednesday August 28, 2013. 39 new of 13 species, 15 recaps. 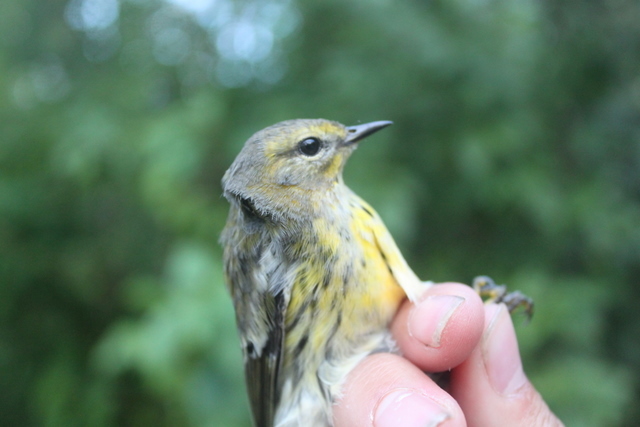 New species: Cape May Warbler (2), and Golden-winged Warbler. Most numerous species: Gray Catbird (7), Least Flycatcher (5), Magnolia Warbler (4), Northern Waterthrush (4), and Ruby-throated Hummingbird (4). The day began as a calm, muggy morning following rain showers overnight. With ample staff on hand and Andrea working with future certification candidates, the birds never waited long to be processed today. Since the work was spread over several banders, I was surprised by the final tally which exceeded what I would have predicted from my contribution. Highlights of the day were our first-of-the-season Cape May Warblers and Golden-winged Warbler. We closed at hour 5.5 due to heat and sun. Monday August 26, 2013 10 new,14 retraps, 7 species. 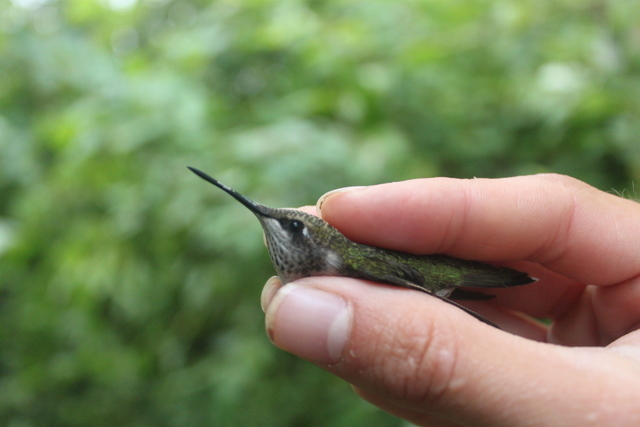 New species Ruby-throated Hummingbird. We opened at dawn and ran the station for an hour and a half before closing the nets. We were closed for 2 and a half hours due to rain. Finally at about 10:00am we reopened the nets. Ryan banded the first two hummers of the season. Ryan demonstrating the correct way to hold a hummingbird! Bird of the day was a tie between Blue-winged Warbler, Magnolia Warbler and Ruby-throated Hummingbird with 2 each. 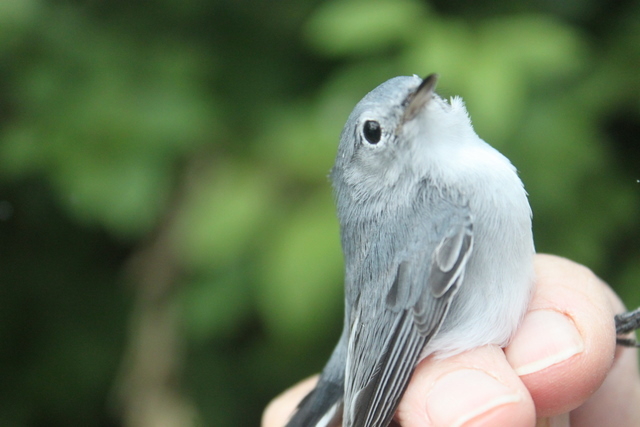 Another nice bird was a HY Blue-gray Gnatcatcher. Three New Species for the Fall! brookser	Fall Banding	Comments Off on Three New Species for the Fall! Saturday August 24, 2013 28 new, 12 recaps. New species Philadelphia Vireo, Veery and Ovenbird. It was a better day today with three new species for the fall. We almost had a “veery good mourning” until the Mourning Warbler was accidentally let go! The best news of the day was that Ryan Kayhart just arrived for his five weeks of banding! 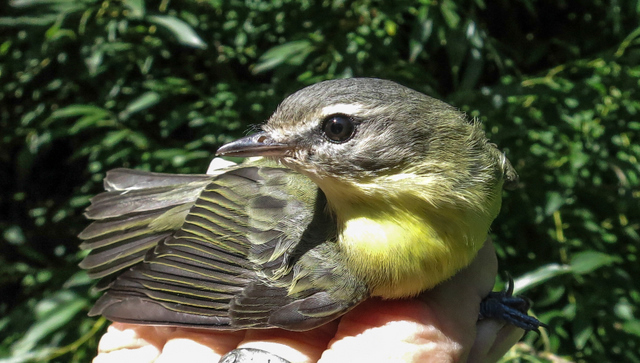 brookser	Fall Banding	Comments Off on First Black-throated Blue Warbler! Friday August 23, 2013 14 new, 9 recaps; new species Black-throated Blue Warbler. We had lots of catbirds, good helpers, good weather but we would have been happier with more good birds! Handsome Baltimore Oriole Brightens the Morning! brookser	Fall Banding	Comments Off on Handsome Baltimore Oriole Brightens the Morning! Thursday August 22, 2013 Today was uncomfortably warm with lots of mosquitos and very few birds. We did re-capture a very pretty BAOR. A Juvenile Swamp Sparrow was confusing because it looked like Lincoln’s Sparrow but wing morphology convinced us that it was not a Lincoln. Sorry to say we didn’t get a photo. We banded nine new birds and only had four retraps. We closed early due to hot weather and lack of birds.